Hush Puppies has popped up in Neal Street, Covent Garden to show and sell a large range of its footwear, including desert boots for men, and fresh floral prints for women. It's open until mid-June, and you can even buy plush puppies in the shop. 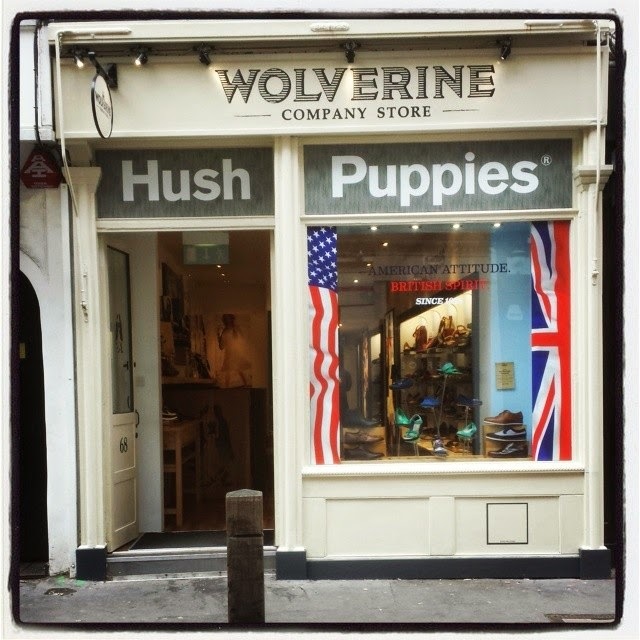 "Footwear brand, Hush Puppies, will be bringing its American heritage and a dash of British spirit to Neal Street this summer as it takes over the Wolverine Company Store from the 22nd May - 15th June, making its mark on the cobbled streets of Covent Garden, the store will showcase its dynamic new Spring/Summer collection and host a series of entertaining activities for style-savvy shoppers to enjoy. Taking inspiration from its 1958 heritage and iconic style, Hush Puppies will be displaying a selection of men’s and women’s styles, which take a contemporary twist on this season’s leisure trend. With fresh new designs, bold colours and fine detailing – there’s a look for everyone! And with an exciting range of in-store exclusives available shoppers are sure to find their perfect pair. Men can take their pick from a range of footwear staples, kick starting their summer in style. With festival favourites like the Desert II, style-conscious men an put suede to the test like never before thanks to the innovative Worry-Free technology, specially developed to be scuff, stain and water resistant, ensuring their feet will survive whatever is thrown at them. For a more formal occasion they can slip into the high quality leather of the Style Monk Strap shoe, which can inject style into even the simplest of outfits. Hush Puppies will also be launching their newest addition, the Aquaice Wallaboot, available to buy exclusively in store which offers a fresh new take on a casual 60s classic. For women looking to pick up some new shoes for the season ahead, they can turn to fresh floral prints for that perfectly patterned look. Must-have flats come in the form of the Tevin Oxford lace-ups, which are the ultimate finish to your sports luxe outfit, or, why not try the Caposhi Strap, which will be available in a range of spring colours in store. Alternatively shoppers can funk it up with a 60s inspired wedge in the Labarre T-Strap for a flawless summer look, which, with their EVA comfort soles ensure their feet will be comfortable whatever the occasion."